I created this logo for photographer, Zoshia Minto. She wanted a logo that would appeal to wedding photography clients yet feel personal at the same time. She wanted to incorporate a zebra into the logo, a reminder of her childhood in Kenya. I used the face of a zebra in a subtle and abstract way. I took a hand drawn approach, creating many options before translating the final logo into a digital format. I worked with the Neighborhood Design Center in collaboration with a team of designers to create a logo that would represent the Druid Heights Community Development Center in Baltimore and the Druid Heights neighbrhood as a whole. The community chose my logo design as they felt that it best represented their vision for the future of the neighborhood. I used a black line connecting the homes and the trees to represent the strong bond between community members. The client wanted a logo that would successfully represent a business involving web-based classes for teaching Quranic Arabic to students. He was very happy with the final logo which uses a classic font to reflect the classical subject matter of the classes. The graphic of a man holding his hands up in Islamic prayer and representing the letter "k" makes the logo memorable. I designed this logo for the annual Run for Skip charity event held by Rydex Investments. Run for Skip was started in the name of Rydex Investments' late founder, Skip Viragh, and benefited research on pancreatic cancer. The logo incorporates Skip Viragh's initials—a sideways letter "S" and an upside down "V". I designed these business cards as part of a collaborative project with the Yampa Valley Design Camp. Our group of nine designers worked together to create a new brand and marketing materials for a local non-profit, all in just one week. This logo for wedding photographer, Mahera Rana, incorporates a peacock feather. The client and I decided that a peacock feather would be a great way to represent her flair for South Asian wedding photography. I designed this logo for poet, Preeti Apte. An imperfect moon and its reflection are balanced, beautiful, inspiring and reflective. 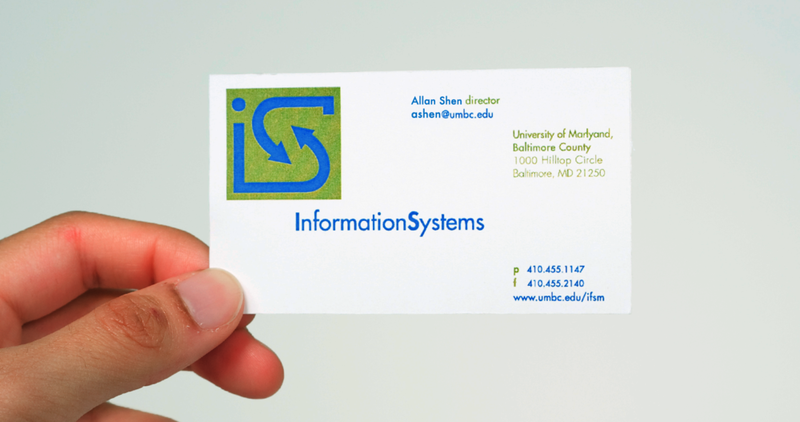 I created this logo design and business card for the Information Systems Department at the University of Maryland, Baltimore County. The arrows represent the exchange of information and data, which are important parts of Information Systems. The logo also contains the shape of an "i" and an "S". The identity manual for the Information Systems Department at UMBC.